Lowell Handmade Art, Music, Film, Food, Culture & More in Boston's Favorite Mill City: Come Discover the Wonder of Art at Western Ave Studios Check out this great new resource for the arts in the city of Lowell..........everything you need to have a great time listed in one place. Also be sure to drop into Studio #326 when at Western Avenue Studios where I and my studio mates can be found on Open Studio Saturdays which is always the first Saturday of every month from 12 noon until 5 PM. We always have a variety of art hanging on our studio walls as well as several works in progress. Come in and enjoy good conversation, coffee and snacks while viewing the art. 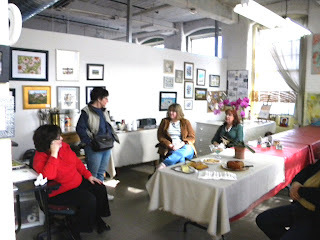 Thought I would include this photo of my fellow artists from the Nashua Artist's Breakfast Club who stopped by my studio #326 at Western Avenue Studios during our March open studio on 3-6-2010. It was great fun to sit and chat about painting and other experiences of the Breakfast Club an informal group of artists which has been meeting at Boarder's Cafe in Nashua New Hampshire for more than 20 years. Being a relatively new member of this group has been wonderful as these accomplished artists have inspired me to continue working on my art and their help, friendship, and support is valued and appreciated. It is also through this group that I have been encoraged to exhibit in four shows over the past two years. Since artists often paint in isolation finding this group has been a wonderful experience. Also through email and facebook and sharing our blogs we are tuned into many happenings in the arts in northern Massachusetts and southern New Hampshire. I was inspired for this painting by a fellow Nashua Artist's Breakfast Club friend Priti Lathia who has done many beautiful paintings of Koi. 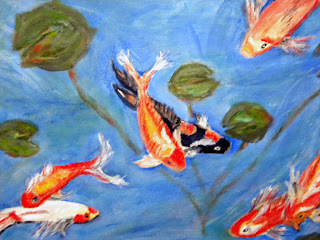 The fish remind me so much of the Koi that I used to keep in the small pond on my front deck in the warmer months. The many colors of the Koi and thair constant motion is a relaxing sight. My first attempt at painting fish, I am somewhat pleased , however, I will try to improve on the subject at a later time. 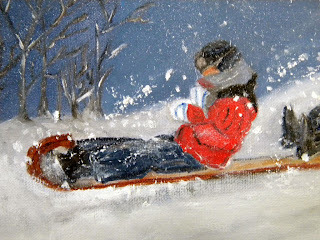 In this painting I tried to capture the fun of childhood and the spirit of winter. I am happy with the result and like the motion it represents. It's now time to focus on more springtime themes. ZI continue to explore many new subjects for my paintings and learn with each new attempt.